Sydney Airport warmly welcomes thousands of passengers every day through our domestic and international terminals. We are committed to providing an inclusive and accessible experience for all passengers and visitors. The staff that work at Sydney Airport, including volunteer Airport Ambassadors are dynamic, caring, helpful, proactive and approachable and work as a team to ensure your experience is one of ease as your travel through Sydney Airport. Airlines offer differing levels of service and ‘special assistance’ to passengers. Check with your airline before you book your flight, to check that their inclusion and accessibility policies, procedures and services meet your needs. You can also find more information about preparing for travel, passports and visas here. Visit your doctor 6-8 weeks prior to travelling and discuss your medical and health needs (physical, mental, emotional) relating to travel. Some airlines may require medical clearance in order for you to fly. Ask your doctor for supporting medical documentation and medication lists (including powdered supplements) - for example, a letter, prescription or medical card. Include details of artificial limbs, medical implants such as hip replacements or pacemakers and any medical devices or aids you may require during your flight, as these will support you going through security process. Explore ways you can care for your body when flying and travelling - hydration, wear comfortable clothing including something warm, moving/exercises to prevent Deep Vein Thrombosis (DVT), self-catering if you have special dietary requirements and breathing exercises to assist with any phobias or anxiety you may have about flying. Log your trip with SmartTraveller if travelling overseas, and make use of the resources provided by the Department of Home Affairs for travelling with specific needs. The way we process sensory input is a major factor in how we participate in our environment. The airport environment can be intense and overwhelming due to the sensory demands (for example, things you see, hear, touch, smell and feel) and because of the processes, such as check-in and security, that we are required to participate in. Before you arrive at the airport, it is important to confirm with your airline the number of bags and weight of each item you can take on your flight. This information should also be displayed on your ticket. It is acceptable to pack a reasonable amount of essential items for your flight in your carry-on baggage, such as medicines and/or hypodermic needles. All other medicines and medical aids need to be packed in your checked baggage. Medical aids such as oxygen tanks and wheelchairs can all be catered for. Please check with your airline. Assistance animals are welcome inside our terminal. Information regarding the eligibility and travel requirements is available on the Department of Agriculture website. It’s almost time to take off! There are many ground transport options available for all passengers for arriving at all of our terminals including: car, bus, train, shuttle, taxi, ride share operators such as Uber and UberAssist, rental cars, limousines, self drive and, bikes. For more information on transport options, visit our Transport options page. Sydney Airport provides accessible parking for people with mobility parking permits within the Domestic and International car parks. There are a total of 60 disability accessible parking bays across the three on precinct Domestic car parks. At the International precinct, there are three separate designated parking areas, with a total of 56 disabled bays available. You will find these spaces clearly signed. Long term parking is also available remotely at the Blu Emu car park. At the Blu Emu car park there are 48 disability accessible parking bays. A regular shuttle bus (approximately every 15 minutes during peak times) provides access to/from the Blu Emu car park to Domestic T2 & T3. The shuttle bus is disability accessible. More information on acccessible parking options can be found on our parking page. Our maps showing parking and walking distances you need to travel, will help you navigate your way through this part of your journey. At all Sydney Airport terminals, there are dedicated accessible drop off zones located at the Departures level with the nearest access points to the terminals. Our kerbside staff are trained to understand the differing needs of passengers with disabilities when leaving a vehicle. Please note that drivers must remain with the vehicle at all times. If your passenger needs assistance accessing the terminal, we recommend an additional person attends to assist while you remain with the car. More details regarding T1 International terminal drop off can be found here. More details regarding T2 and T3 Domestic terminals drop off can be found here. In general, each passenger is responsible for lifting their luggage onto the weigh belt at check-in. If travelling by yourself and you need assistance with your luggage, pre-arrange support by contacting your airline. Your travel agent can also assist you with this. In both T1 International and T2 Domestic the check-in counters are located on Level 2, Departures. Depending on your airline, there may be different options which may include mobile check-in, online check-in, check-in kiosks, auto check-in and airport check-in. Thinking ahead and planning the way you check-in for your flight, may also determine the assistance you can access. Confirming deadline for check-in with your airline is important. Carriers are not able to delay flights and being late may result in the loss of your fare. Be aware of the luggage size, weight and content requirements as each airline’s requirements will differ. In general, each passenger is responsible for lifting their luggage onto the weigh belt at check-in. If travelling by yourself and you need assistance with your luggage, pre-arrange support by contacting your airline. Your travel agent can also assist you with this. Domestic: You will need to present your ticket, identification such as a drivers license or proof of age card, and boarding pass if you have already have one from a check-in kiosk. International: You will need to present your passport and ticket. The terminals have many Flight Information Display Screens (FIDS) throughout the public areas to advise flight arrival and departure times, boarding calls, ‘flight landed’ information, gate numbers and baggage carousel details. In keeping with Sydney Airport’s quiet terminal initiative, in T1, passenger and flight announcements will be contained to gate areas. Any essential announcements will be made across the terminal. You can also check the status of your flight through the Sydney Airport website, @flySYD Facebook and Twitter. Security is a service and a government requirement that provides safe travel for all passengers and is an important part of your journey. Sometimes the security process may feel stressful. We encourage you become familiar with the following information and to take your time as you move through the security process. Security is on the same level as Check-In. If it is not immediately visible to you, ask staff at the check-in counter or one of our volunteer Airport Ambassadors to direct you. Always leave ample time to make your way through security, particularly if you have implants, pacemakers, walk aids and or other prosthesis. During the security process, you will be asked to take part in a security screening (i.e., X-ray, Body Scanner and Metal Detector) or a physical search (or pat down) and/ an Explosive Trace Detection (ETD). Security staff will ask if you have completed an ETD previously, and if not, they will explain the process. You will find more detailed information on security at Sydney Airport here. If you’re departing from T1 International terminal, you will be required to go through passport control either electronically via SmartGate or manually with an Australian Border Force (ABF) Officer. Families travelling with young children, passengers who are unable to use Smartgate without assistance and those with non-scannable passports will be directed to an Australian Border Force Officer for manual processing. If using the departures SmartGates does not work for you, you will be checked by an Australian Border Force officer. Once you have cleared security you may have time to enjoy the facilities at Sydney Airport. Using the lifts is advised if you have luggage with you. There are also escalators provided. Throughout the airport, you will find many retail shops, including duty free shopping and varied food and beverage outlet. You will also find facilities such as accessible bathrooms, pharmacies, ATMS, drinking fountains, charging station, printers, public telephones and TTY phones. A full list of accessible services and facilities can be found here. Free Wi-Fi and Internet kiosks are available throughout T1 International and T2 Domestic terminals. You can view or download our terminal maps here. If you require immediate medical assistance, please present yourself to any airport employee or volunteer ambassador and request Sydney Airport First Aid. An aircraft is accessed usually via ramps and aerobridge. If you need wheelchair assistance, please pre-arrange with the airline 48 hours prior. Boarding will be managed by your airline. General timings are listed as below. Most aircrafts will usually disembark via an aerobridge, however some flights may require passengers to exit via stairs to the tarmac. If you have advised your airline of your additional assistance requirements, assistance will be ready and available to you. If you are arriving on an international flight you will need to participate in passport control processes. Please make sure you have your passport, visa (if applicable) and completed incoming passenger card which you would have received on board the aircraft. You will be required to go through passport control either electronically via SmartGate or manually with an Australian Border Force (ABF) Officer. 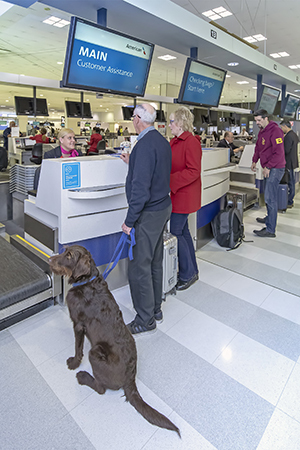 To help protect Australia’s environment, Australian Department of Agriculture and Water Resources and Australian Border Force Officers screen all incoming international passengers and their belongings. It is mandatory to declare certain items on your Incoming Passenger Card. Your bags may be checked as part of this process. If you have any specific enquiries regarding these procedures including additional information on assistance animals please contact the Department of Home Affairs or the Department of Agriculture and Water Resources. You will now collect your luggage from the baggage reclaim area. If you require assistance removing your luggage from the carousel, please make direct contact with your airline. If you’re unable to locate your bag on arrival from the baggage reclaim, you will need to approach airline staff at the airport to complete a report to describe your bag in detail, along with your contact information and delivery address. You can follow up with your airline’s ground handler here. Your airline will be able to advise if you need to collect your luggage, before transferring for your next flight. If you are transferring from the International terminal to Domestic terminal, all passengers must collect their luggage and pass through passport control and Quarantine requirements before transferring to the Domestic Terminal. The following options are available if you are transferring between T1 International and T2/T3 Domestic terminals. Should you require assistance, please contact your airline to see what assistance they are able to offer. If you are transferring on a Qantas or Virgin Australia flight, you may be eligible to use an airline transfer service. For more information and to confirm your eligibility please click here. The T-Bus is a complimentary and regular loop service (between 6:00am - 8:50pm), between the T1 International and T2/T3 Domestic terminals. It takes approximately 10 minutes to complete the ride between terminals, depending on traffic conditions. The T-Bus is wheelchair accessible and the bus stop is located on the Arrivals level of each terminal. Airport Link offers a $6.40 (one way, per person) single transfer ticket for passengers travelling between the T1 International and T2/T3 Domestic terminals via train. However, pricing does vary if the traveller is using an Opal Card. The journey takes only two minutes and there are frequent services between 5am and midnight, seven days a week. Kerbside staff can assist you with organising specific requirements you have for transport (i.e., wheelchair accessible taxis). There are many ground transport options available for all passengers departing from all of our terminals including: car, bus, train, shuttle, taxi, ride share operators such as Uber and UberAssist, rental cars, limousines, self drive and, bikes. Two accessible pick up spaces are available on the Arrivals level of all terminals with wheelchair ramps. Drivers must remain with their vehicle at all times. If you are picking up a passenger with a disability, and as a driver you do not have a Mobility Parking Permit, the driver may utilise the disabled zones. However, the passenger with the disability must be waiting at the kerbside. For a full list of accessible facilities throughout our T1 International and T2 Domestic terminals, visit our Accessible Facilities and Services page. Download and print our helpful Journey Planner before you travel. Refer to the planner throughout your journey for tips, reminders and useful contact information. Here are some useful resources that will help towards a smooth journey. Don't forget to plan ahead.